Metro Thermal Imaging offers the latest technology in infrared inspections for a wide range of applications and industries. Our company uses the latest thermal imaging cameras/technology from Flir Industries to locate and identify problems not visible to the eye. Thermal imaging software is used to provide fully comprehensive image & report generation. 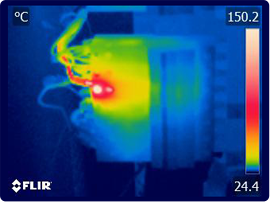 Excessive heat in electrical system components is an indication of potential equipment failure. Over heating components and poor connections can cause problems that can lead to expensive failures resulting in costly downtime. Visual & manual inspection methods of finding these potential failures are both costly and time consuming. 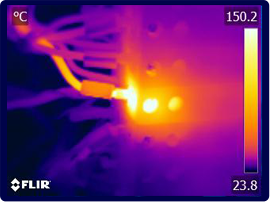 Metro Thermal Imaging can accurately locate abnormalities that threaten the safety and reliability of your electrical system components by using the latest generation of infrared technology. 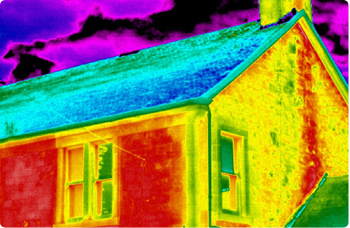 Infrared thermography enables us to see and measure heat. All materials emit heat in the infrared portion of the electromagnetic spectrum. Simple thermal images (thermographic) allow us to see the thermal anomalies that in turn identify problems in components. The infrared camera can also record temperature measurements of specific objects. The points of possible interest show up clearly as hot or cold relative to their surroundings. Remedial works can be scheduled ahead of time. This facilitates proactive maintenance over reactive maintenance and prevents costly unscheduled downtime.